A few days ago I visited Lynnwood’s Heritage Park hoping to tour a vintage trolley car from the Seattle – Everett Interurban Railway and learn a little about the town’s pre-Depression era poultry boom as the second largest egg producing area in the country. This three acre city park is actually the final resting place for a number of historic buildings that were moved to make way for freeway expansion projects but a post about the collection will have to wait for another day. The restored trolley car was behind a locked gate and the buildings were closed for the season so I wandered through the wet grass taking pictures some pretty fall mushrooms. Posted as part of the Weekly Photo Challenge: Minimalist. 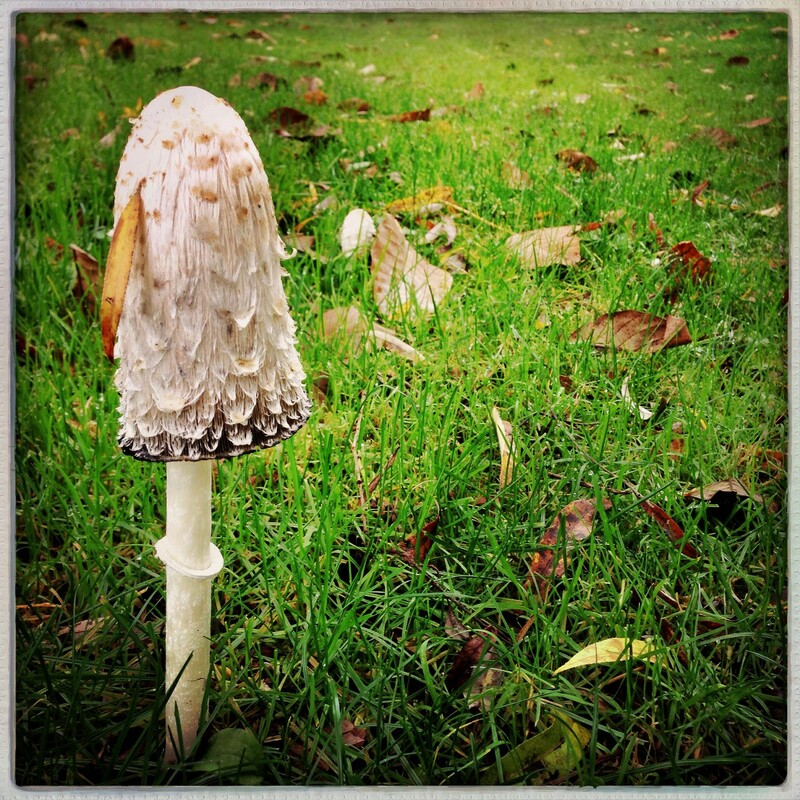 I’m not sure about the perspective, but that looks like one might big ‘shroom!! It was about 6 inches tall, Joanne. 🙂 I was about as close to the ground as I could get without getting muddy. wow – great angle! It looks about a foot tall!! OMG. This is just awesome, Lisa. Lucky you. THAT is what I call mushroom. Great shot. I’ve been keeping my eyes on mushrooms. Perpetua. Very cool. I took endless shots of mushrooms while in France. So many of them are beautiful, especially the poisonous ones! What a beautiful dress she’s wearing! Good eye, D’Arcy the ruffles are perfect! A mushroom! That is too cool! This is pretty cool, but nothing can beat my favourite mushroom pic of yours: that one that almost looked like a cartoon, with the polka dots! very cool shot of the mushroom. Second largest egg producing area. I never knew that. I was surprised to learn this too. The electric railroad brought families north from Seattle to live and farm while still being close enough to a city to sell their goods. The chicken farms didn’t survive the depression but it’s nice to know some history has been preserved. Wow that an interesting mushroom. It looks like the back head of a blond! Thank you, Seonaid. It did seem like it had just come through the grass and hadn’t had a chance to feed any of the local squirrels or birds yet. What a perfect image for this challenge! I swear we have the coolest mushrooms! Whoa! Just how tall was that mushroom? “Camera magnets” is a great phrase. 🙂 Thanks for your visit and comment today! Love the amount of details on its head 🙂 Well done, Lisa!